This recipe was part of our brunch on Christmas day. This is a breakfast frittata version, but frittatas are good for a quick lunch or dinner as well. Just put in whatever veggies you have on hand to replace the sausage. I make it with peas or spinach a lot. 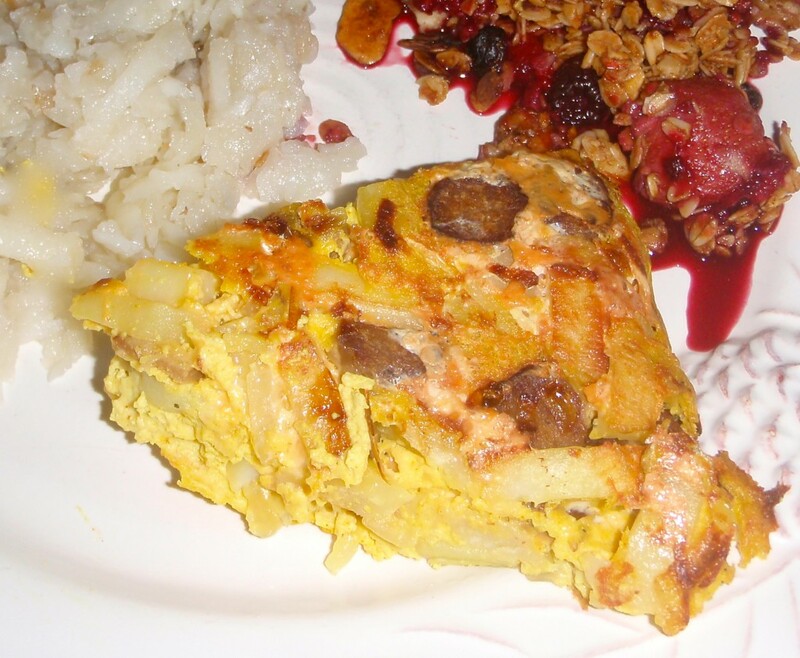 This is a very versatile frittata recipe. Combine the tofu, soy milk, turmeric, nutritional yeast, salt and pepper in a food processor and mix it until it is smooth. Heat the oil in a oven proof medium nonstick skillet. Add in the sausage and cook for 5 minutes until it is browned. Add in the onion and potato and cook for another 5 minutes. Add in the cheese and the tofu mixture. Stir it until all the tofu is evenly distributed. Cook on the stove top over medium heat about 8- 10 minutes. Transfer the skillet to the top rack of the oven and turn the broiler on. Broil the breakfast frittata for about 10 minutes. Keep checking it to make sure it does not burn. Once the top is nicely browned and the middle is set take it out of the oven. Let it sit in the pan for at least 5 minutes. You can cut it serve it from the skillet or flip it over onto a plate and slice it for a nice presentation. These cinnamon rolls are an amazing soft, fluffy and sweet. 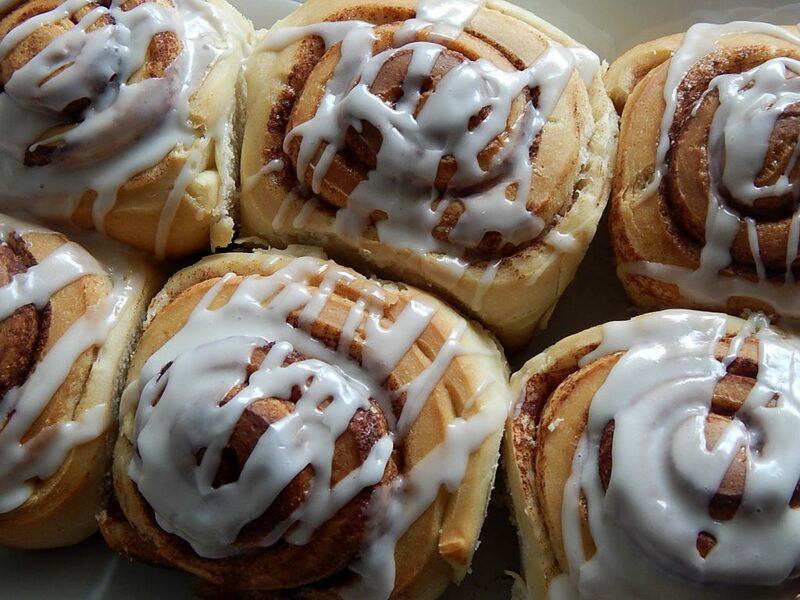 There is nothing better than warm gooey cinnamon rolls right out of the oven. They get made the night before and sit in the fridge overnight, so they are ready to bake in the morning. Merry Christmas! Here are some recipes that I am planning on making for Christmas. This year I am keeping the menu simple and some what traditional. 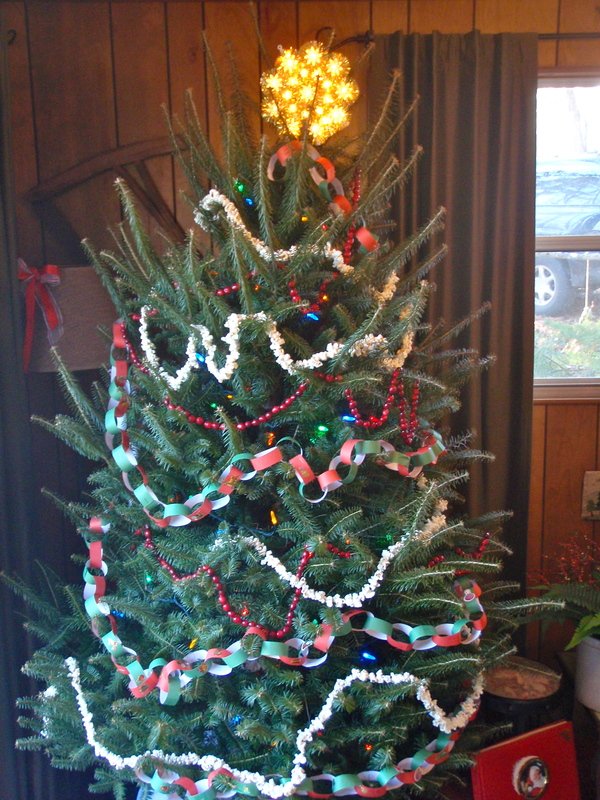 We will not have all of our extended family this year so it should be a quiet Christmas. I hope you all have a very happy holiday. Put the flour, sugar, and salt in a food processor. Pulse to combine. Add in the butter and shortening. Pulse until the butter and shortening are coarsely combined with the flour. There should still be some small pieces. Slowly add the water with the processor running until the dough comes together. Remove the dough, divide it in half and wrap in plastic wrap. Refrigerate for at least 1 hour. Preheat the oven to 375. After the dough has chilled, roll it out and press it into a tart pan or a 9 inch pie pan and cover it with parchment. Put in pie weights or fill the shell with dry beans to keep the crust from puffing up while it is baking.Bake the crust for about 10 minutes then set it aside to cool. In a large bowl mash together the tofu, garlic, lemon, nutritional yeast, salt and italian seasoning. Let it sit while you cook the onions. Bring 1/2 cup of water to boil in a sauce pan and add the onion. Cook the onion for about 30-45 minutes until it has caramelized adding more water as needed to keep it from sticking. 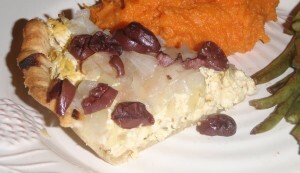 Put the tofu mixture into the pit shell and top it with the caramelized onion and olives. Bake it for another 20 minutes. Combine all of the ingredients in a sauce pan and bring it to a boil. Boil for about 20 minutes. Transfer it to a bowl and let cool. Preheat the oven to 375. Put the fruit and the sugar into a casserole dish and mix it together. Top it with the granola. Bake it for about 20-25 minutes until it is nice and bubbly. I like to serve it with non dairy yogurt, but it is great with ice cream too. Pasta and no-meatballs is one of my go to meals. The whole family loves it and it is easy, as well as inexpensive to make. 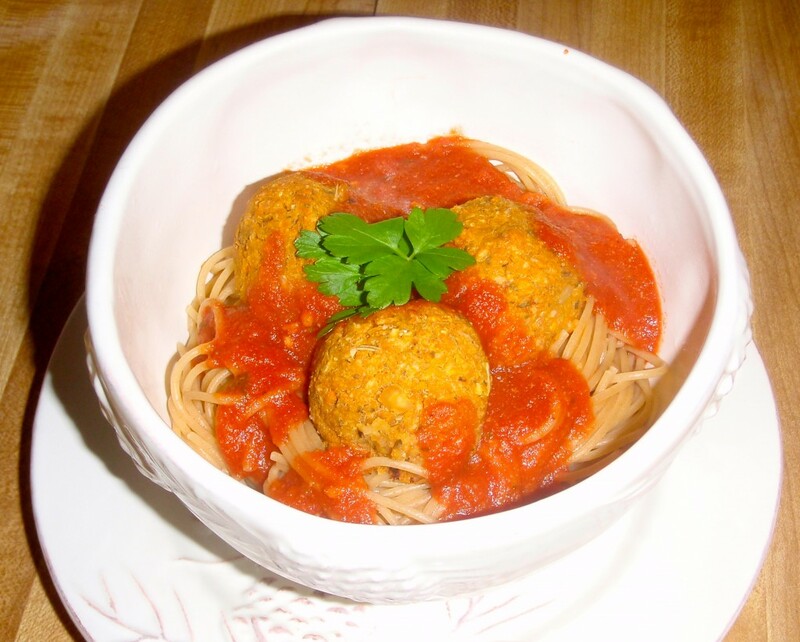 The no-meatballs have a great texture and hold up well with the sauce and pasta. I usually serve this with a salad or some steamed broccoli. Preheat oven to 375. Grind up the oats in a food processor and put into a large mixing bowl. Add the chick peas, carrot, onion and garlic in the food processor and pulse until everything is coarsely chopped. You want to make sure it still has some texture. Add it into the bowl with the oats. Add the remaining ingredients and mix until it is thoroughly combined. Lightly oil a baking sheet. Roll the no-meatballs into balls about an inch in diameter. Place on the oiled baking sheet. Bake them about 20 minutes, rolling them at least once. Cook the pasta and heat the sauce while the no-meatballs are baking. 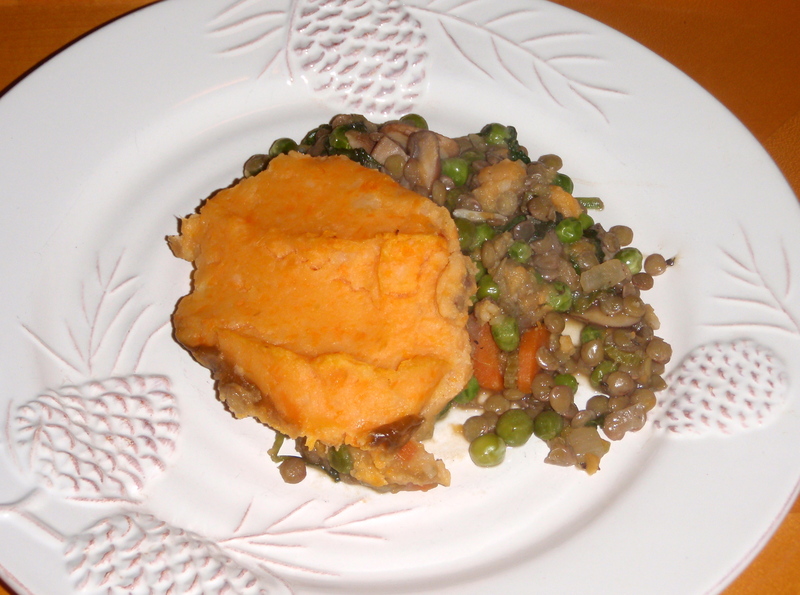 This is not your typical shepherd’s pie. 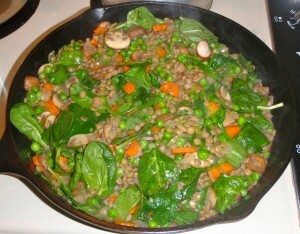 This one is full of veggies, as well as lentils. 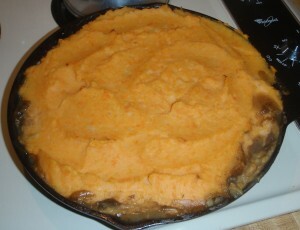 The topping is a combination of sweet potatoes and regular potatoes mashed together. The whole family loved this recipe. Peal and diced all the potatoes and put them in a large pot of water. Bring it to a boil and cook until the potatoes are very tender, about 15 minutes. Drain the potatoes and mash them with the soy milk and the butter (add a little milk at a time until you get the consistency that you like, you may not use it all). Add salt and pepper to taste. While the potatoes are cooking start the filling. Heat 1 tbsp of the oil in a large nonstick skillet. Add in the mushrooms and cook until they start to brown, about 5 minutes. Remove the mushrooms from the pan and heat the rest of the oil. Add in the onions and cook for 5 minutes. Add the garlic, carrots and celery and cook for another 5 minutes. Add in the peas and cook until they are heated then add the spinach and cook until it is wilted. Add in the mushrooms, the cooked lentils, thyme and salt and pepper. Mix the arrowroot powder into the broth and pour into the pan. Transfer it into a large casserole dish and then spread the mashed potatoes evenly over the top. Bake 20 to 25 minutes until the top begins to brown and it is bubbly on the sides. Let it sit for about 10 minutes before serving. I have to thank my Mom for this recipe. She made it for us the other night and it was so delicious. Living in the south I see fried green tomatoes on restaurant menus all the time, so it was a real treat to actually have some. 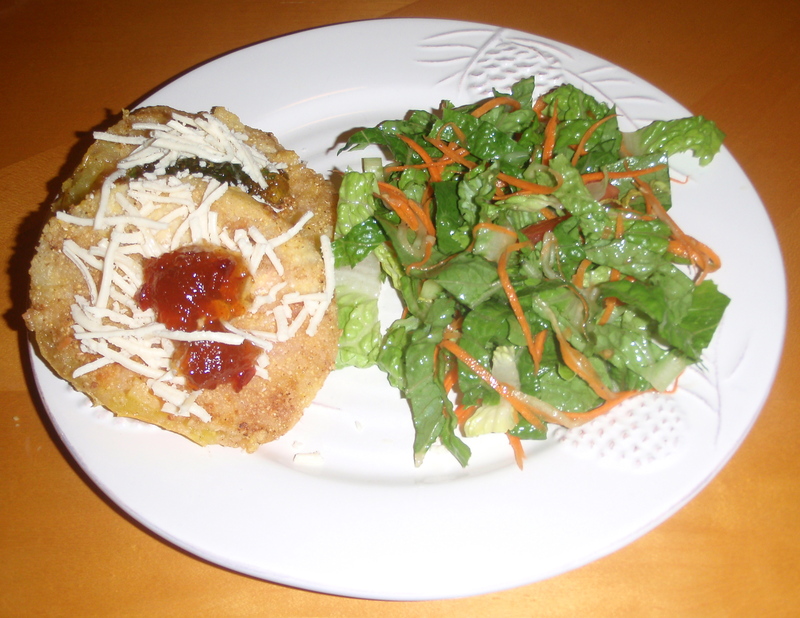 We topped ours with green pepper jelly, red pepper jelly and Daiya mozzarella. Combine the cornmeal, flour, salt and pepper in a medium bowl. Heat the oil in a large non-stick frying pan. Dip each tomato slice into the milk and then into the flour mixture to coat it. Place it in the hot pan and fry them about 3-4 minutes on each side until the are golden brown. You don’t want to overcook the tomatoes because they will get mushy. When they are done cooking place them on a paper towel to remove the excess oil. Serve hot. 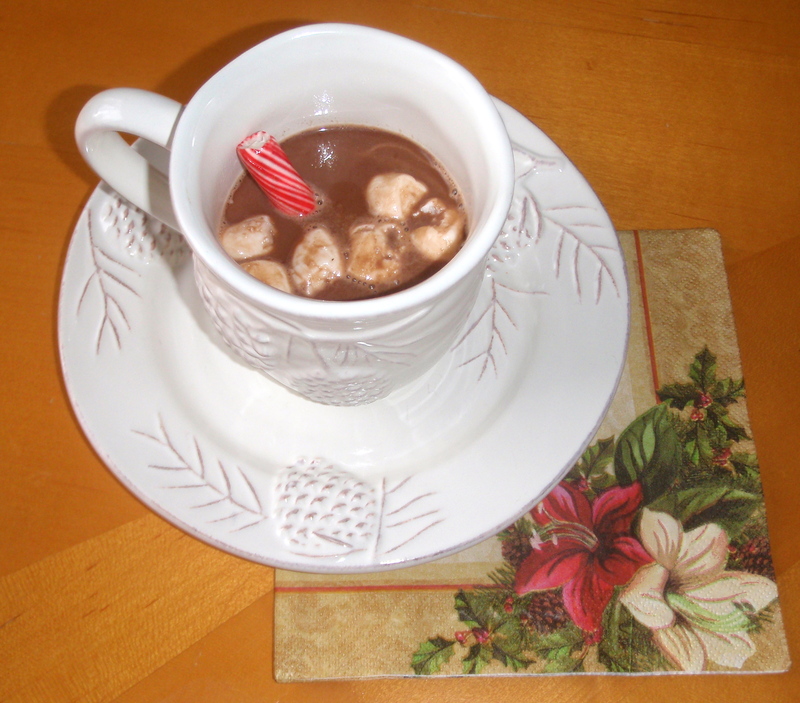 This is the perfect time of year for hot chocolate. My kids are always asking for it and I hate for them to have the stuff out of the package, so I made my own. This recipe doesn’t have that much sugar and it is super chocolatey. I found vegan marshmallows to go in and we put in peppermint sticks too. I will be making this again tomorrow when we decorate our Christmas tree. Put all of the ingredients in a medium pot and cook over medium heat. Whisk to combine the ingredients. Try to not boil it, just cook it until the chocolate is melted, the cocoa powder is well combined and it is hot. Serve with you favorite toppings like marshmallows, non dairy whipped cream or peppermint sticks.